There was a long silence, as everyone considered what Dave had just said. Matt spoke first. "Dave, that has to be wrong. If you're right," he said, "we've just wasted three months. And I wouldn't want to be in the room when you tell Tolman." 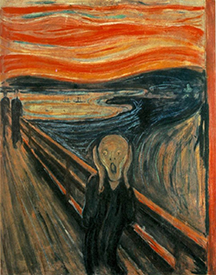 The Scream (1893), by Edvard Munch (1863-1944). Oil, tempera and pastel on cardboard, at the National Gallery of Norway. An iconic representation of fear. Photo courtesy Wikimedia Commons. Carl was probably the most upset of all of them. "Actually, I'd like to see that myself. You're nothing but negative, Dave, and personally I'm sick of it." Then he stood up and left the conference room. Matt and Carl are demonstrating two different responses to the bad news they've just received. Acknowledging difficulty can be so uncomfortable or frightening that we sometimes prefer the comfort of ignorance. Our discomfort can be so compelling that, like Matt or Carl, we become willing to adopt or cling to false beliefs that conform better to our wishes than does reality. And we'll stick with those illusions until we're forced to recognize our folly. Teams and organizations have real advantages if they excel at detecting and eliminating myths and confusion. Here are some of the milestones on the path to Clarity. Whether we're clinging to myth or just confused, all progress depends on recognizing that there's something wrong with what we believe. Usually recognition comes to us through Messengers — a few courageous souls who are willing to withstand our objections and our sometimes-personal attacks. that we cling to illusionsacknowledging our error can take the form of accepting the word of the Messengers. More often, we acknowledge our error while finding some minor flaw in the assertions of the Messengers. That way we can change our views without ceding status to the Messengers. To make further progress, we have to realize that we ourselves will have to create the change we need. This step can sometimes be the scariest, because we have to accept that no mysterious force will do our work for us. By telling others that we understand that things must change and that we'll be changing them, we express commitment to finding a new path forward that departs from the one we traveled to get here. Finally, we take some concrete action that we hope will move us toward a resolution. It might not actually work at first, but as long as we keep at it, each attempt gives us new insights about the reality of the problem. Would you like to see your comments posted here? rbrenJkuVRTsEMBxrdaCpner@ChacTlxunaZApBdlNVUFoCanyon.comSend me your comments by email, or by Web form. See also Organizational Change, Problem Solving and Creativity and Critical Thinking at Work for more related articles. I offer email and telephone coaching at both corporate and individual rates. Contact Rick for details at rbrenOQEvqAaSVCAoyzluner@ChacGSJqiEcknpzeOmmuoCanyon.com or (650) 787-6475, or toll-free in the continental US at (866) 378-5470.